Formation lasts a lifetime. Our goal as pilgrims is to come to Mary’s house to stand symbolically where she has stood and to utter ‘yes’ in the context of our life. It is to be, as Bl. Elizabeth of the Trinity says, ‘another humanity wherein Christ renews all his mystery’; it is to be like Mary at the Annunciation, opening oneself to the work of the Spirit who forms Christ again in the body and soul of the person who listens and adores. Taking into account the needs of the Community, the talents of the individual and the common good, members are encouraged to acquire professional and creative skills with which they will be able to nurture and sustain their personal vocation and that of the COLW. Specialised training is offered to members of COLW whose ministry requires it. 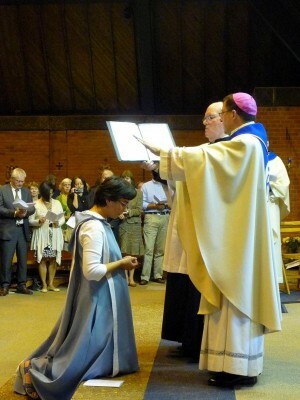 Vows are renewed annually for 3 to 6 years after which final profession is made. Six months before the taking of permanent vows, members re-enter a house of formation to prepare sufficiently for this important step.